After the initial flurry of activity at the beginning of 2012, when the first round of ABS licences were granted by the Solicitors Regulatory Authority (see blog entry in March 2012) and the Co-op announced its plans for the development of its legal services offer (see blog entry May 2012), there has been sure and steady progress on the ABS front. Russell Jones and Walker, together with an Australian Firm, Slater and Gordon have a licence to develop ABS, based on their merged business. Irwin Mitchell, a large UK based law firm, have acquired 3 ABS licences to develop their practice – they have been widely reported as intending to raise private capital by a flotation on the Stock Exchange. As well as ministerial changes there have been changes in two of the top judicial jobs. Lord Phillips, who was the first President of the Supreme Court, reached retirement age this autumn. He is replaced as President, from 1 October 2012, by Lord David Neuberger – who was formerly the Master of the Rolls. See http://www.supremecourt.gov.uk/news/new-president-of-the-supreme-court.html. Over the summer, the Prime Minister shuffled his ministerial team. Ken Clarke, the former Lord Chancellor, was one of the minister to lose his job (though he remains in the Cabinet). Replacing him is Chris Grayling. You can read a bit about him at http://www.justice.gov.uk/about/moj/departmental-board/chris-grayling-mp. Press coverage suggests that Grayling is likely to be ‘tougher on crime’ than his predecessor – a reputation arising from the time he was the Shadow Home Secretary before the arrival of the Coalition Government. I’m not so sure. While his predecessor sought to argue for changes in penal policy based on their efficacy, he was also seeking to save money – putting people in jail is expensive. The need for public expenditure cuts remains – so it is not clear how far Grayling will be able to lock more people up, even assuming that that is what he wants to do. First, welcome to all the new students starting on their law courses. Wherever you are studying, have a great time. The legal system is currently undergoing great change. The practice of law is also undergoing great change. 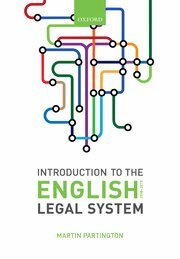 In Introduction to the English Legal System I offer an account of those changes which will affect everyone graduating in 3/4 years time. But the pace of change is so rapid that it is hard to keep track of everything. Use this blog to pick up key developments; but also visit the linked blogs for additional information and ideas. Let me know if there are things you would like to read more about and I’ll try to address them. Don’t be misled by all the formality and pomp, which may suggest that the legal system is ticking on just as it has done for the last 100 years. In fact, the judicial system is also undergoing great change – changes also considered in my book and in this blog. For students and those entering the law, all this change offers great opportunity for innovation and development. What I would encourage you to do is think how things might be done differently and more efficiently; what are the varietes of opportunity that law offers; and how can you contribute to increasing access to justice.